The Worm Ouroboros by E.R. Eddison is considered to be a classic of the fantasy genre, rediscovered during the 1960s as the canon of modern fantasy was developed in a post-Tolkien world. Drawing its influences from classic epics of the Nordic, Celtic, and Greek cultures, the novel tracks the culture clash between the noble and straight-dealing denizens of Demonland and their treacherous enemies in Witchland. It also has characters with names like Goldry Bluzsco, La Fireez, Spitfire, and Cargo, so strap yourselves in for some real high fantasy nonsense. What will Kate and Jack make of the numerous old timey ballads and poems within the book's pages? Which characters does it seem like the author wanted to make kisses on? Who in their right mind would publish a ravenously pro-war novel four years after the close of World War I? What do Electric Wizard, decadent literature, and McDonaldLand have to do with any of this? 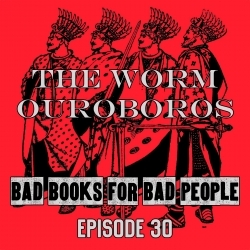 Listen to the latest episode of Bad Books for Bad People and find out the answers to these questions and more.